Recruiting Days will kick off Tuesday, September 20, from 1- 4:00 p.m. with Public Service and Creative Careers Recruiting Day. Bad news about the job market is everywhere these days, but Stephanie Spencer, assistant director of Wright State’s Career Services, said she thinks things might be looking up. Spencer, who organizes the biannual, on-campus Recruiting Days event, said that employer registration for recruiting days is up significantly from recent years. The event consists of three separate sections—a science, technology, engineering and mathematics (STEM) recruiting day, a business recruiting day and a public service and creative careers recruiting day—and Spencer said that both the business and STEM sections have reached capacity. There is even a waiting list for the business employers. 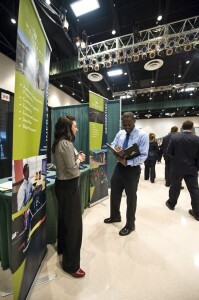 In an economic climate where so many people are competing for jobs, Spencer said a career fair like Wright State’s Recruiting Days can help applicants in their job search. “Career fairs are important for students because it gives them an opportunity to jump-start their job search or internship search, an opportunity to have face-to-face contact with organizations and companies that are hiring,” said Spencer. She added that career fairs are also good places to network and to learn more about experiences that could advance a résumé. Recruiting Days isn’t limited to students; alumni looking for jobs and internships are welcome to participate. To take part in Recruiting Days, students and alumni need to register using the Wright Search. This will make their résumé available for critique by Career Services staff before Recruiting Days and for review by employers. Spencer also recommended that participants use the Wright Search to view the lists of employers who will be attending Recruiting Days. If any of the organizations or companies stand out, she suggested researching that employer. Recruiters appreciate an applicant who has done his or her research. Though Recruiting Days is divided into STEM, business and public service and creative careers, Spencer encouraged students and alumni of all majors to approach any employer that they find interesting. One piece of advice applies to students and alumni from any and all disciplines: professional attire and professional behavior are strongly encouraged. Applicants should wear conservative, professional business suits. Men should wear ties. Spencer says that every year, when employers fill out surveys about their Recruiting Days experience, they mention qualities they are looking for in applicants. Leadership, confidence and professionalism all make the list, but Spencer says that the top requirement is always professional dress. Applicants should attend Recruiting Days on their own, without friends, parents or spouses. Recruiting Days will kick off Tuesday, September 20, from 1 to 4:00 p.m.
focusing on career choices in government, social action, health care and the communication/entertainment industry. Recruiting Days will continue Wednesday, September 21, from 9 a.m. to noon with STEM Recruiting Day focusing on career choices in science, technology, engineering and math. Recruiting Days will continue that day from 1:30 to 4:30 p.m. with Business Recruiting Day. All events will be in the Wright State University Student Union Apollo Room. Students and Alumni wishing to attend any of these events should register in The Wright Search. Professional dress and a résumé are required to attend. Any student or alumni who would like their résumé reviewed in advance or would like to practice in a mock interview session is encouraged to schedule an appointment with a Career Services advisor. To schedule an appointment call (937)-775 2556. http://www.wright.edu/administration/career/. A list of participating employers is available in The Wright Search. Visit the Event Calendar at career.wright.edu for more information and to access The Wright Search: http://www.wright.edu/administration/career/events/calendar.html.